Sample Be Used To Help Your Business? When you are researching to find information about writing an Operational Plan for your business it is always a good idea to look at what other businesses are writing about. That is why it is a idea to review an Operational Plan Sample for ideas for your business plan. You can always learn something new or even learn things you may not want to do in your business. Lessons can be learned everywhere you go and look, as far as finding and learning new things. With that said, reviewing other Operational Plans can help you write a plan for your business. But one thing I often caution about is not to use others business Operational Plan Samples, word for word only use them as a guide as to what you may want to write about in your plan. Only use them for ideas. Plus no two businesses are exactly the same and if you are starting yours from scratch it surely should be different from other businesses. Plus, you only want your Operational Plan to be about your business and not someone elses. 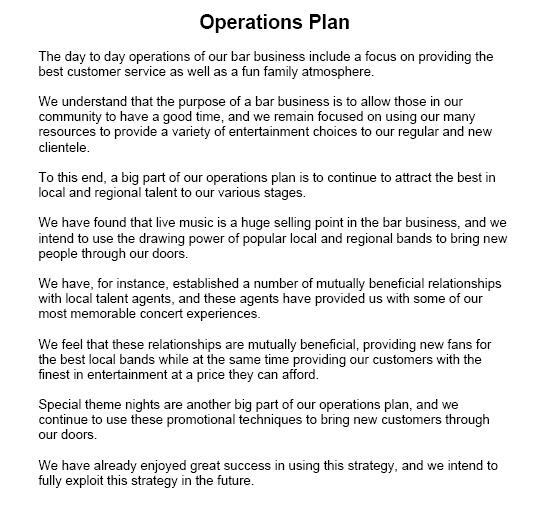 This sample Operational Plan is going to be about a new dollar store that you are planning on starting. In this sample you are only going to use some of the sections of the Operational Plan, but not all of them. You may want to include sections about Marketing, Inventory, Accounting, Law Services, Management, Employees and Customer Service. Miller Dollar Store is a new friendly and fun place that offers everything for a dollar or less. It is a great place for your entire family to visit and everyone leave happy without leaving broke. We use several methods to market our business. This business is new and we feel like we need to get the word out about it. We decided to use radio advertising on the local stations in several different genres. The reason is because it will reach a large amount of people at a considerable cheaper price than TV advertising. We also used classified and small space ads in local publications. We placed them in all of the local major publications and several smaller ones in this area. We use Reliable Supply Company for our entire inventory. We have found that they are true to their name as far as making sure they have everything we need. If there is any problem we have researched several supply companies for back up purposes. Our Accounting Plan includes using a CPA to help with our accounting. We complete our financial statements, weekly and monthly and when they are completed they are passed on to the CPA firm to be checked and corrected if needed. Our financial Statements include our balance sheets, income statements and cash flow statements and all of our analysis statements. We have obtained law services from a law firm. They handle any type of legal services we may need. Our management team consists of 3 men and women. Our management team has a total of over 60 years of experience in this field. Shauna has a background in accounting and administration. Anne has experience in marketing and sales. David has experience in sales and training. This management team is a perfect match for the success of our business. Our Employees are a variety of people from different backgrounds with various amounts of experiences. We are looking for workers that are looking for long term employment. We feel that this is the best match for the success of our business. We have an inside motto if our employees are happy, we and the customers are happy, with this type of work environment we believe its best for everyone. It is an absolute win, win situation. We offer a 30 day money back guarantee on all nonperishable items. Perishable items may not be returned. The Operational Plan for your business is how your business is run on an ongoing basis. It is separated into different sections for the purpose of explaining the different sections that need to be covered in your plan. Also an Operational Plan Sample should only be used to help you with obtaining ideas for your plan only. The Sample is not intended to be used for you to copy it word for word. As noted before your business is going to be different from other businesses and if it is not, you may want to consider making it different. Uniqueness is generally best for a start up business. So why is an Operational Plan so important to your business? Without one, do you think your business will succeed?